Speaking before the UN General Assembly on Oct. 28, 2014, Marzuki Darusman, the Special Rapporteur on the situation of human rights in the Democratic People’s Republic of Korea (DPRK) encouraged action to stem the ongoing human rights abuses in the country. Specifically, Mr. Darusman encouraged submitting the Commission of Inquiry’s report to the Security Council to “send an unequivocal signal” to the DRPK that serious follow up would be taken. The report itself found systematic, widespread, and gross human rights violations amounting in some cases to crimes against humanity. The human rights violations are unsurprising to most members of the international community. Amnesty International and Human Rights Watch have both reported on the many egregious conditions imposed upon the people of the DRPK. One example are prison camps for political offenders that impose ‘collective punishment’ (imprisoning entire families, including the children of offenders). According to the US State Department, the political prisoners number in the tens of thousands and may exceed 80,000 individuals. The United Nations must ensure that those most responsible for the crimes against humanity committed in the Democratic People’s Rebublic of Korea are held accountable. Options to achieve this end include a Security Council Referral of the situation to the International Criminal Court or the establishment of an ad hoc tribunal by the United Nations. The language used in the Commission’s report demonstrates a clear call for justice on the international stage. 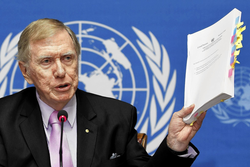 Chairman of the U.N. Commission of Inquiry on Human Rights in North Korea, Michael Kirby, spoke at U.N. headquarters, urging action on the report. Photo Credit: Salvatore Di Nolfi / European Pressphoto Agency, http://articles.latimes.com/2014/feb/17/world/la-fg-un-north-korea-20140218. Non-cooperation has been an ongoing problem for the Commission, as is noted in the report, but recent developments must have caught the attention of the DRPK officials. Mr. Darusman was “unexpectedly” met by four North Korean diplomats who sought to discuss a potential visit to the DPRK. The meeting was the first contact with a UN inspector regarding the human rights situation in the last 10 years. Reaching out may be a good sign, but it remains to be seen whether North Korea will allow Mr. Darusman access to the political prisons much less acknowledge their existence. Equally unclear is whether the issue would withstand the veto powers of Russia or China if it reaches the Security Council. Both nations have aligned with North Korean interests in the past. Russia itself currently faces significant political pressure in the international arena, but that is certainly no predictor of how the delegation will vote. Jordan Edmondson is a 3L at University of Denver Sturm College of Law and a Staff Editor for the Denver Journal of International Law and Policy.